TheCityFix, produced by EMBARQ, is now accepting applications for a full-time writer and blogger in its Washington, DC headquarters. Photo by Richard Masoner/Cyclelicious. Are you a creative, early-career professional with strong writing and editing skills? Are you passionate about communications and urban sustainability? Do you want to work for the #1 environmental and natural resources think tank? If your answers to these questions are a hearty yes, we have an opportunity for you. 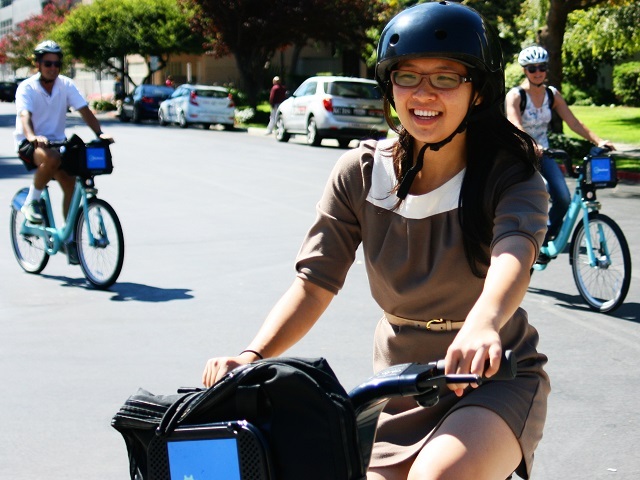 EMBARQ, the sustainable urban transport and planning program of the World Resources Institute (WRI), and producer of TheCityFix, is now accepting applications for a full-time Writer and Blogger Intern in its Washington, DC office. See position details and instructions to apply below, or apply now. EMBARQ, the World Resources Institute’s program for sustainable urban transport and urban planning, is seeking a creative professional to assist our Communications and Marketing Team in generating content for TheCityFix.com blog and EMBARQ.org news section, as well as the EMBARQ Network News monthly newsletter. This internship is ideal for recent graduates or early-career professionals in communications, marketing, public relations, environmental science, English, liberal arts, or related studies. You will get real world experience in a fast-paced environment. Internships may vary in length depending on your schedule, interest, and abilities. Recent graduate or early-career professional with a degree in communications, marketing, public relations, environmental science, English, liberal arts, or related studies. Commensurate with education, experience and position responsibilities. This position is based in the Washington, DC office of the EMBARQ Network and reports to EMBARQ’s Communications and Marketing Manager. The World Resources Institute is an Equal Opportunity Employer. It is WRI’s policy to recruit, hire, and provide opportunities for advancement in all job classifications without regard to race, color, religion, gender, national origin, age, citizenship, marital status, sexual preference, parental status, or disability. WRI cannot provide a H1B visa for internship candidates. Applicants are responsible for establishing their own visa work status. WRI’s mission is to move human society to live in ways that protect Earth’s environment and its capacity to provide for the needs and aspirations of current and future generations. Established in 1982, WRI has grown to be respected globally by policymakers, NGOs, and corporate leaders alike because of the rigorous quality, balance, and independence of its work as a global environmental think tank that goes beyond research to put ideas into action. We operate globally because today’s problems have no boundaries. We are avid communicators because people everywhere are inspired by ideas, empowered by knowledge, and moved to change by greater understanding. The entire WRI team, including employees, interns and fellows, see the results of their hard work and have the satisfaction of making a significant difference in the world. The EMBARQ global network catalyzes environmentally and financially sustainable transport solutions to improve quality of life in cities. Since 2002, the network has grown to include six global centers, located in Brazil, China, India, Mexico, Turkey, and the Andean region, that work together with national and local authorities to reduce pollution, improve public health, and create safe, accessible and attractive urban public spaces. The network employs more than 150 experts in fields ranging from architecture to air quality management; geography to journalism; and sociology to civil and transport engineering. EMBARQ’s global strategy aims to achieve the following impacts by 2016: over 16,000 lives saved, 6.7 million tons of CO2 emissions avoided, 11.8 billion transport trips served, 3.1 billion hours of travel time saved and $6.2 billion in investments leveraged.